For downloading filled in form. 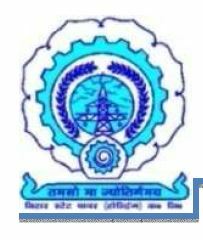 Bihar State Power (Holding) Company Ltd. invites applications from eligible candidates for appointment on the following posts for Bihar State Power (Holding) Company Ltd. (BSPHCL), North Bihar Power Distribution Company Ltd. (NBPDCL), South Bihar Power Distribution Company Ltd. (SBPDCL) & Bihar State Power Transmission Company Ltd. (BSPTCL) and Bihar State Power Generation Company Ltd. (BSPGCL). i. One applicant may submit application for more than one post separately. iii. The number of posts is subject to change as per requirement, without giving any prior notice. iv. Reservation of Physically Handicapped Person (PHP) shall be as per Govt. of Bihar rule. i. Chief Data Base Administrator : Consolidated Pay Band - Rs. 70,000-1,12,000 (4% annual increment) for probation period of three years. ii. Data Base Administrator : Consolidated Pay Band - Rs. 42,000-67,000 (4% annual increment) for probation period of three years. iii. IT Manager : Consolidated Pay Band - Rs. 32,000-51,000 (4% annual increment) for probation period of three years. a. Chief Data Base Administrator : B.E./B.Tech. (Computer Science/ IT) with first class/ MCA from any Govt. /AICTE recognized Institution/ University with Minimum 8 year experience in handling large database project with knowledge of Oracle/SQL/MY SQL/ Dot net/ Java/ PHP and Android based applications. b. Data Base Administrator : B.E./B.Tech. (Computer Science/ IT) with first class/ MCA from any Govt. /AICTE recognized Institution/ University with Minimum 5 year experience in Handling large database project with knowledge of Oracle/SQL/My SQL/ Dot net/ Java / PHP and Android based applications. a. Chief Data Base Administrator : Maximum 45 years for all the category. i) PHP (Physically Handicapped Person) Candidates shall get age relaxation by 10 years additionally in maximum age limit. They will have to produce latest disability certificate of Civil Surgeon indicating the physical disability of 40% or more, as and when required. Electricity Board, shall get relaxation in maximum age limit by 5 years additionally. power plant or any other infrastructure/establishment of the Board. employment, on the basis of being a land displaced person. The probation period shall be 3 years from the date of appointment. Pay Scale in regular establishment shall be admissible after successful completion of probation period, subject to their conduct and performance remaining satisfactory and their achieving the minimum performance targets/ indicators decided and evaluated by the competent authority during the probation period. a) Function as the organisation's head of data management/ system administrator for very complex, very large, multi platform information system. b) Serves as the Chief Technical Consultants with Company responsibilities. c) Co-ordinates, the design, coding, testing and documentation of complex company level database, database applications or substantial application modification. d) Co-ordinates the evaluation of hardware and software products and programming. e) Performs as specialized duties as Senior level Data Base Administrator. f) Responsible for setting technical standard and direction. h) Application & system software installed at data centre & data disaster recovery centre. i) Duties entrusted by M.D. or HOD's from time to time. a) To assist the Chief Data Base Administrator in his functions. b) To manage, maintain, install necessary application and database etc. c) To provide wide Oracle database/RDBMB Administrative support for production system and provide Data Base Administrative service to application. d) Controlling and monitoring user access to the database. e) Monitoring and optimizing the performance of the database. f) Planning for break up and recovery of database information. i) The work entrusted by M.D. or HOD/ CDBA from time to time. planning and development of resources. f) To Control the computer systems budgets and expenditures. g) To Manage the operation of the application & system software, System (Hardware) at Data Center and Disaster Recovery Center. h) The work entrusted by M.D. or HOD/ CDBA/DBA from time to time. a. Reservation will be given in terms of reservation rules and policies as per Govt. of Bihar. application along with the Caste and Creamy Layer Certificate issued by the Competent Authority of his/ her home district in the prescribed Performa of Govt. of Bihar issued not more than a year before. The Candidates belonging to SC/ST are not required to submit the Creamy Layer Certificate. original at the time of document's verification, his/ her claim for such reservation benefit will be forfeited and his/ her Candidature will be considered under UR category/ general candidate. a. For, Chief Data Base Administrator/ Data Base Administrator : Rs. 1500/- (Rupees One thousand five hundred only) only for all categories except SC/ ST of Bihar domicile, for whom it will be Rs. 375/- (Rupees Three hundred seventy five only). b. For, IT Manager : Rs. 1000/- (Rupees One thousand only) only for all categories except SC/ ST of Bihar domicile, for whom it will be Rs. 250/- (Rupees Two hundred fifty only). 31963202219 in any branch of State Bank of India by filling a triplicate Challan which will be downloaded from prescribed website as mentioned at Sl. No. '10.0' and then obtain journal Number from the bank after depositing required application fee before final filling and submitting the 'ON LINE' application. The applicant must write journal Number, on the "ON LINE" auto generated application along with other details. The application fee is non-refundable in any case. Therefore, the candidates are advised to ensure that they are eligible for the applied post in all respect. Before submitting the application "ON LINE", the applicant must ensure that the Journal Number entered is correct in all respect. In case of non-encashment of deposited fee due to any discrepancy, the application will be rejected. d. SC/ ST candidates of other States will be treated as UR candidates even for the purpose of Application fee. i. Candidates would be shortlisted on the basis of marks obtained in the ‘Written Test’. iii. Weightage for Written Test, Work Experience and Interview should be 40%, 30% and 30% respectively. ii. Merit List would be prepared on the basis of Written Test, work Experience. iii. Weightage for Written Test and Work Experience should be 80% and 20% respectively. “ON-LINE” application; Candidates have to take a print out of the same. POST OFFICE KOLKATA: 700 002 so as to reach on or before the last date i.e. Up to 24.06.2015 upto 5:00 PM. Application received after last date of receipt, either due to postal delay or for any other reasons, shall not be considered/ entertained. c. Print out of the filled in ON-LINE application form having auto generated Registration number and Bank journal number must accompany self signed Passport size Photograph snapped within last six months. ii. Marks sheet and passing certificate of B.E./B.Tech. (Computer Science/ IT) MCA (as required). v. Permanent Domicile Certificate if reservation benefit is claimed. vi. "No Objection Certificate" from the previous employer. ix. BSPHCL Copy of Challan (in original). b. Click to fill ON-LINE application for the post being applied for. recent passport size photograph in the space provided on the application form. d. Accept the filled in ON-LINE application. e. Auto generated registration number will appear on "on-line" application form. g. Now go again to above named website. h. Click to download your customized Bank Challan form. i. Mention your auto generated registration no. in specified column and press enter. j. Select the option of customized bank challan, Triplicate customized Bank Challan will appear. Take print out of the same. k. Deposit the same duly filled with requisite application fee in any SBI branch. l. Bank will give a journal no. on the Challan. m. Now go to the above named website and click on 'enter' on Bank Challan deposit details and fill up the requisite columns and save Challan information. Finally click on ‘Submit’. n. Now take a print out of finally submitted application and enclose all relevant documents as well as original BSPHCL copy of Challan and post the same (only through ordinary post) on the given address. separately with requisite application fees and all required certificate/ documents. online application is found wrong, his/her candidature will summarily be rejected. c. The Print out of the application has to be sent only through ordinary post. No application will be entertained or received through person. The name of the post & category must be super-scribed on the envelope containing the application. d. The person employed in Govt./ Semi Govt. organization/ Public sector must also send the additional copy of the print out of the ON-LINE application form through proper channel, so as to reach by 24.06.2015 upto 5:00 PM. The envelope containing this application must clearly be super-scribed as "through Proper Channel" and name of the post applied for. e. The minimum qualifying marks in the written test will be 40% for UR, 36% for BC, 34% for EBC & 32% for SC/ST/ Female candidates. f. The selected candidates shall have to produce relieving letter from the previous employer at the time of resuming his duty, if they are working with other employer. percentage of marks, caste & Creamy layer certificate, domicile certificate, PHP certificate, photographs etc. is furnished by him/ her. h. Must submit permanent Domicile Certificate of Bihar (If reservation benefit is claimed). j. Canvassing in any form shall debar the candidate from selection. k. In case of Name/Surname changed, a copy of Gazette of that effect should be submitted as and when required. l. The centre for written test will normally be in Bihar, but BSPHCL reserves the right for deciding the examination centre. m. No TA/ DA will be paid to the Candidate, if called for Written Test/ Counseling etc. n. Mere submission of application does not guarantee the adequacy of candidature for being considered for selection process. o. The BSPHCL reserves right to cancel the selection process at any stage and increase or decrease the number of posts to be filled according to the exigencies of the Company. p. Selected Candidates will be called for document verification/ counseling. q. Candidates are advised to possess a valid e-mail ID and mobile number, which is to be entered in the on-line Application form. The e-mail address specified in the application should be valid/ functional for at least 12 months from the date of the submission of application. applicant in his/her ON-LINE application subject to encashment of Bank challan receipt submitted by the applicant. s. Admit Card may be downloaded from the website. NO Admit Card shall be delivered through post. 13.0 The BSPHCL will not be responsible for any printing mistakes/postal delay.